HARRISBURG, PA (December 1, 2017) – Harrisburg Mall has announced the schedule of special event and promotional activities for the 2017 holiday season, as well as the roster of seasonal retailers. Located on 3501 Paxton Road, Harrisburg Mall is a one million square foot regional mall with more than 70 tenants, including anchor stores Macy’s and Macy’s Backstage, Bass Pro Shops, Destination XL, 2nd & Charles and Regal Cinema’s Great Escape Harrisburg Mall Stadium 14. Visit www.ShopHarrisburgMall.com for full details. The seasonal tenants are Cavanaugh’s Collars, which sells locally-made gifts for pets; Gifts & More, offering Christmas-themed items including toys, alpaca sweaters, hats and gloves; and Penn Leather, a retailer selling leather apparel and accessories. 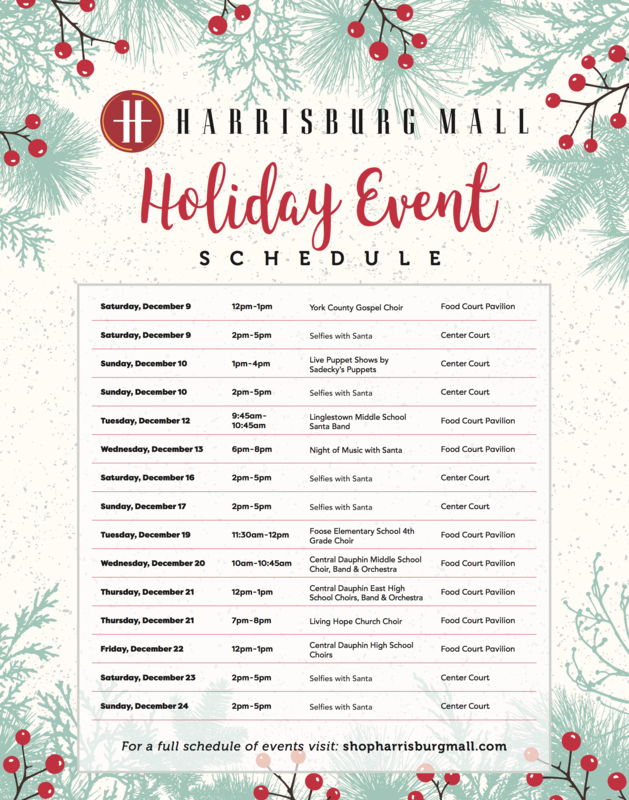 In addition, Harrisburg Mall will feature two Holiday Carts: Happy Toys, offering barking toy dogs and Holiday Ornaments, which sells personalized ornaments for Christmas trees. Harrisburg Mall is owned and managed by Baltimore-based St. John Properties, Inc. For additional information, contact 717-564-0980 or visit www.ShopHarrisburgMall.com.